Despite an outraged community and a petition that garnered over 225,000 signatures, Infinity Ward's Robert Bowling says the PC version of Modern Warfare 2 has been a "tremendous" success for the studio. Between the uproar over the lack of dedicated servers that spawned a quarter-million-signature online petition, a boycott by many digital distributors over the game's use of Steam DRM and the fact that the Steam version itself, despite preloading in advance of the game's launch, wouldn't actually unlock until two days after the retail version hit the shelves, you might think that sales of the PC version of Modern Warfare 2 would be badly hobbled. According to Robert Bowling, the community guy at Infinity Ward, however, you should think again. 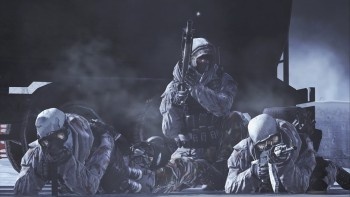 "Yes, PC is the smallest percentage in terms of how much sold on each platform but that hardly means anything other than the PC is just the smallest market," he wrote on Infinity Ward's Modern Warfare 2 PC forum. "The PC version of Modern Warfare 2 has actually outsold the PC version of Call of Duty 4: Modern Warfare in it's first week. Making it the most successful PC version." "Essentially, all this percentage proves is that the console versions sold great, not that the PC version sold poorly, because that's actually not the case," he continued. "The PC version has done tremendous in it's first week, better than our previous game." He doesn't quote actual unit sales in the message but with overall sales of Modern Warfare 2 estimated to be somewhere in the multi-bazillion range, it's safe to say that the PC version, despite being far and away a tiny percentage of overall sales, still adds up to an awful lot. Many followup posts in the thread criticized Bowling's comments, saying that while massive levels of hype may have pushed up unit sales the PC's shrunken slice of the pie is proof that Infinity Ward has treated the platform badly; most sales charts don't account for digital game sales, however, so it's possible the percentage could be higher than Bowling quoted.